Ariel Dorfman’s Homeland Security Ate My Speech is a deeply thoughtful, poetic, and critical analysis of the fractured political landscape in America. The central protagonist is President Donald J. Trump, whom Dr. Dorfman sees as symptomatic of far deeper fault lines of national disunion. Dorfman brings a particularly intriguing and useful comparative perspective to this work. For he is a Chilean, long in exile after the brutal overthrow in 1973 of the democratically elected socialist president, Salvador Allende. Siding with the anti-fascist resistance, he was captured, tortured, and expelled. Thus, he is especially sensitive to and wary of the impulses, actions, and dynamics that lead to violent dictatorial, authoritarian regimes. Dorfman’s critique is personal, intellectual, devastating, and at times bitingly funny. Thus, contemporary American political dynamics are refracted through Dorfman’s comparative Chilean-American-Global lens that weaves analysis through the imagined view of historical actors (Phillip II and James Buchanan, both of whom provide great words of encouragement to the new president), literary figures (Shelley, Faulkner, Shakespeare, Cervantes, Carroll, Melville), and crafters of resistance (MLK, Mandela, Clarke, Einstein). Out of his deep despair and sense of both dread and loss, he offers a voice of hope that a thoughtful, measured citizenry will prevail against an autocratic presidency and the immeasurable pain it will inflict, especially on the most vulnerable. The book is composed of short essays written at various times and for various venues during and after the most recent presidential campaign. The collection is clustered into four sections: The Rise of Donald J. Trump, The Judgement of History, Models of Resistance from the Past, and What is to be Done? The idea that people are the creation of their material and social circumstances looms large, along with the caution that history repeats itself. The 16th century Spanish King, Phillip II, pays a clairvoyant visit with helpful noble instruction to Mr. Trump. Phillip II reigned during a period of economic decline and perceived social decay that triggered the expulsion of Muslims; an Inquisition against the unfaithful, alternatively faithful, and wrong thinkers in general; and new regimes of discipline targeting unruly women. History segues into literature. Mary Shelley and William Faulkner shed analytical light on dehumanized othernesss and cultural alienation. Pivoting to the contemporary scene, Dorfman argues that the Trump would not have resonated if the particular combination of charisma, maleness, swagger, celebration of excess, American exceptionalism and entitlement, and the expulsion of identities deemed “not like us” had not deeply and emotionally resonated with a big cross-section of the American public. Faulkner would have empathically understood how cultural alienation born of poverty, marginalization, loss, and desperation could lead to an embracing of an authoritarian dream that claims to know the magical formula that will lead to a return to bygone better times. As a political anthropologist, the Trump campaign appeared initially as an exquisite example of a highly distilled nativist symbolic politics—build a wall, throw them out, bring coal and manufacturing back, more military might, Make America Great Again—directed at the plethora of identities and policies supposedly causing decline. On deeper consideration, we can extend that initial analysis and contend that Trump’s rhetoric and ritual can be seen as a kind of revitalization movement. These emerge under conditions of deep cultural chaos—here think of the Ghost Dance that swept the Great Plains starting in the late 1800s, as devastated Native American tribes attempted to makes sense of and regain purchase in their cultural worlds. Do the right rituals, invoke the right religious chants and the oppressors will be expelled and the buffalo will return. We might think of Trump as the byproduct of a particular set of structural and historical circumstances that led him to be a kind of 21st century Wovoka. Middle and upper-class America has grown complacent. Dorfman notes, for example, that he did not take Trump seriously as a candidate, an all-too-common refrain. Alarm bells are now sounding. If you think it can’t happen here, it’s time to do a serious reality check. The “it” is an authoritarian system dominated by oligarchs and their government enablers. The “it” is the reframing of knowledge (e.g., fake news, rejection of science). The “it” is the suppression of alternative voices through fear and intimidation (or worse). Our new president has said he would like to punch a protester in the face and expressed an interest in torture as an intelligence gathering technology. Dorfman explores the effects of torture through the case of Eric Lomax a British soldier serving in Asia during World War II. Lomax was a prisoner of war who was a laborer on the infamous Bangkok-Burma railroad. He was regularly and brutally tortured with deep, lasting psychic damage. Only late in life did Lomax find some peace through forgiveness. Turning torture on its head, Dorman asks, would it be acceptable to torture the despicable Iago in Shakespeare’s Othello? There might, one might suppose, be some base satisfaction in revenge. The intolerable cost, Dorfman notes, would be our own dehumanization in the process. Enter James Buchanan who is thrilled to have a companion whose potential for incompetence and hubris eclipses his own. Best known as the president who brought us the American Civil War, he yearns to no longer be known as the worst president in the nation’s history. Martin Luther King, Nelson Mandela, Maura Clarke, and Albert Einstein all sought out non-violent paths to social justice and a better world. All fought against various forms of state violence. Their stories interpenetrate the world and words of Miguel de Cervantes whose Don Quixote explored the fragility of the human experience, as well as our ability to be transcendent. Cervantes, for example, was jailed by Muslim pirates in Algiers for five years. Rather than let his heart burn with rancor and revenge in the clash of two cultures, Dorfman tells us that Cervantes chose to embrace tolerance of radical cultural difference, while raising freedom as the highest physical and moral good. In today’s lingo, we might say that we can “get woke” and emancipate ourselves from oppression. Herman Melville provides a counterpoint to Cervantes’ hopefulness. What happens when the Confidence Man takes over the ship of fools and goes on an obsessive, fatal chase after Ahab’s white whale? For he understands how easily (and cheaply) people are seduced by demagoguery and extremism under the right conditions. 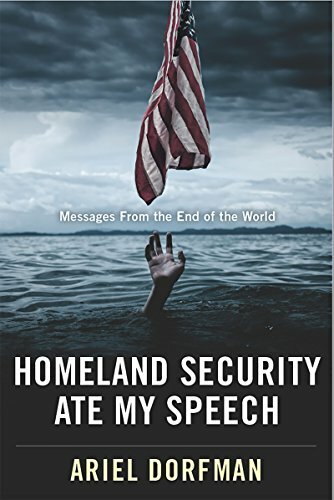 Dorfman concludes with a series of essays anchored by “Homelands Security Ate My Speech.” He crafts a plausible-enough scenario about being the wrong identity, in the wrong place at the wrong time, with wrong words and ideas as deemed by U.S. Homeland Security Agents at the Miami airport after jetting in from Caracas. He can’t talk his way of the interrogation room, and his words are embargoed. In the end, we turn to Lewis Carroll’s Alice in Wonderland as a cautionary critique of the left’s ineffective resistance to dictatorship: chaotic games played with petty exclusiveness, navel gazing, ego gratification, ever chasing down a one rabbit hole or another. Resistance becomes its own end game rather than a pursuit for true liberation. Take heart, there may be a way out of the rabbit hole, or a detour around it. A theme in Dorfman’s body of work is the notion of fence-sitting. For example, in the documentary, Hidden Scars (1994), which explores the anguished life a Maya Guatemalan who had been tortured and released during the later stages of the country’s civil war (1960–1996). Speaking about the effects of state terror and torture, Dorfman describes a resonating chamber of fear that engulfs citizens in its foul fog. He then notes that you have a couple of choices. You can sit on the fence or you can resist. But what might be a response to dire circumstances? Dorfman turns the Melville’s Bartleby, whose resistance is reminiscent of “weapons of the weak” explored by James C. Scott, which explores small acts of everyday peasant resistance in rural Malaysia. For Bartleby resistance is enveloped in a simple phrase—“I would prefer not to . . .”—which Dorfman sees as a “stubborn and placid refusal to go along.” If enough people just say no, it really gums up the works. James H. McDonald is Provost and Professor of Arts & Sciences at the University of Montevallo. He has edited Crisis of Governance in Maya Guatemala and The Applied Anthropology Reader, and has authored numerous articles, review essays, and book reviews for a wide variety of journals including American Anthropologist, Human Organization, and Ethnohistory. Additionally, he has received numerous academic awards, grants, and consultancies.